Janet McGlynn is director of communication and outreach in UMBC’s Office of Undergraduate Education. Each year I have the pleasure of organizing a unique forum for sharing students’ extraordinary research, creative projects and scholarly contributions to the common good. Undergraduate Research and Creative Achievement Day (URCAD) 2014 (Wednesday, April 23rd) will feature more than 200 presentations by UMBC students on projects spanning (and sometimes blending) the disciplines. Evaluating the Efficacy of Low-Tech Processes in Removing Bacterial Contaminants from Drinking Water Supplies in Isongo, Kenya, by Dalton Hughes, Chris Mullen, Madison Bondoc and Hollie Adejumo (Mentor: Lee Blaney, Chemical, Biochemical and Environmental Engineering). This presentation explores water quality issues affecting a small village in Kenya visited by the students and their faculty mentor on a recent Engineers Without Borders trip, and proposes a method for removing contaminants that were tested on UMBC’s Library Pond. 10:45 a.m., Oral Presentation, UC 310. Resource-sharing and Psychological Sense of Community among First-Generation Latin American Immigrants, by Kaitlyn Golden (Mentor: Anne Brodsky, Professor, Department of Psychology). This research focuses on two support networks used by first-generation Latin Americans: their families and their fellow members of the Latino/a community. 2:45p.m., Oral Presentation, UC 312. Baltimore Voices: Creating a Comprehensive Sense of Place and Identity, by Samantha D. Hawkins (Mentor: Sarah Chard, Associate Professor, Department of Sociology and Anthropology). This photo-ethnographic research investigates what it means to be a Baltimorean and explores the complex interaction between place and identity, indicating a common view of Baltimore as a “blue collar,” hard-working, small town, whose residents share a mutual respect for one another. Additionally, the changing industrial scene in Baltimore has resulted in a collective mourning of a loss of Baltimore history and identity. 1:45p.m., Oral Presentation, UC 312. Arts Advocacy: Promoting Policy Change, by Mary B. Hester (Mentor: Carolyn Forestiere, Associate Professor, Department of Political Science). While research suggests that there is a correlation between participation in the arts by children and academic performance, the arts, specifically dance, are often the first programs to be eliminated when cuts need to be made. This research focuses on the benefits of dance lessons for children enrolled in the Easton YMCA and Elementary School Summer Learning Program, and attempts to communicate the results in a policy-oriented manner. 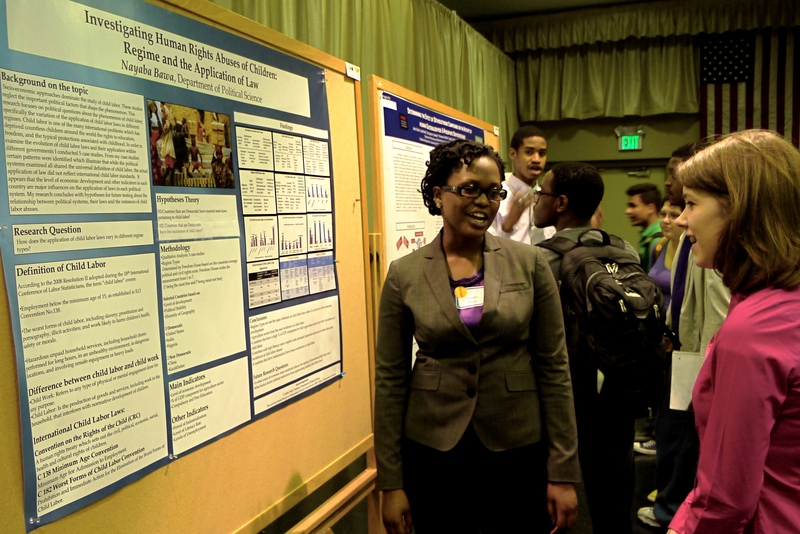 12:00 p.m. – 2:00 p.m., Poster Presentation, UC Ballroom. Tactile Tools for Educational Research, by Samantha A. McDonald, Joshua Dutterer (Mentors:Shaun Kane and Amy Hurst, Assistant Professors, Department of Information Systems). This presentation focuses on using a laser cutter and 3D printer to create inexpensive custom tactile tools in order to help a visually impaired student grasp online visual assignments, including color formats, font types, web layouts, and web design. 10:00 a.m. – 12:00 p.m, Poster Presentation, UC Ballroom. I’m looking forward to being informed, provoked and challenged by these and many other student projects. What are you looking forward to seeing and learning about at URCAD this year? Contact the author, Janet McGlynn, at mcglynn@umbc.edu. See what some of UMBC’s undergraduates are up to at URCAD!